Companies like Eaton are examining their supplier base, and Herrington says, jettisoning those that aren’t keeping up with technology and manufacturing savvy. Companies that aren’t looking over their shoulders at what can be done in developing countries are going to be losers. 'We've gone beyond just wanting good quality and on-time deliveries, they are givens,' Herrington said in a press release from the Subcon Exhibition, which will be held April 22-24 in Birmingham, UK. “Skill and equipment levels are taken for granted; we expect suppliers to have modern machines,” he continued. The deeper questions Eaton is asking potential suppliers are about planning methods, warranty returns, internal yield and scrap rate. Herrington expects suppliers to be practicing the whole philosophy of lean manufacturing. Like serious attention to quality methods ten or so years ago, a competitive differentiator is becoming a basic requirement. Programs like those of Airbus can have a life of 20 to 30 years, so making it as an Eaton supplier can ensure a secure future for companies committed to continous improvement. These qualities have to be coming to the fore for all sorts of manufacturing supply chains, in the UK or elsewhere. It’s time for companies to redouble their lean improvements, and the opportunities are out there. I’ve never really been a dog person, but my son, Chris, is one and so is his wife, Natalie. They’ve adopted Fritz, a white Maltese, and Mona, a miniature dachshund. Chris and Natalie have been living in Hong Kong for four months and have entrusted Mike and me with their care. 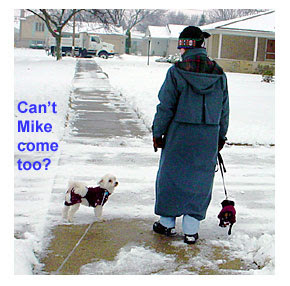 Mike’s a dog-lover too. I’ve been watching the “dog whisperer” Cesar Millan on the National Geographic channel and have been learning that anyone can learn to be a good pack leader and help their dogs behave in what Cesar calls a “calm-submissive” manner. Too many people allow their dogs to become dominant and out of control, evidently, by treating them like people. Dogs are happier being dogs, according to Cesar. Cesar has studied dog psychology and learned from dogs themselves. He has a “pack” of about 40 dogs that behave nicely with each other as long as any tense or negative people stay out of their enclosure. The first thing he says is that dogs want nothing more than to walk along with their pack leaders, in emulation of their normal migration behavior. They don’t want to be confused about who is making decisions and keeping them on the right path. So to be the pack leader, you have to keep the dogs on a short leash about half a step behind you. You maintain a calm, easy, steady gait. The dog’s collar is up just behind his ears, not around his neck, so any “correction” doesn’t hurt but gives the dog the message that the way is ahead, not around the tree or after the squirrel. Cesar says dogs need an hour of walking a day. Normally dogs don’t pay attention to anything I say, unless it’s “dinner,” so I decided to use Cesar’s methods to become the alpha dog, the pack leader. Fritz and Mona are generally well-behaved. Fritz is a wanderer, but won’t run away. Mona is smaller than a loaf of bread, but she could pull me down the road if I were wearing roller skates, and she feels she has a mission to rid the world of squirrels. She wants to carry out the mission with high-pitched barking and squealing. Our doorwall has an open view of the backyard and the bird-feeder, so this was something of a problem. Being the pack leader has some good lessons for being a lean leader. People aren’t dogs, of course, so you can’t just put leashes on them or give them loud commands and expect good results. That’s been tried. 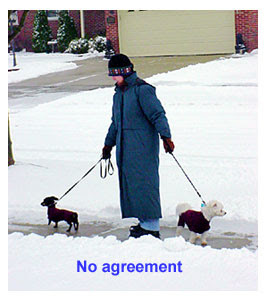 But what about walking with them? As a pack leader, I am at the doggie gemba. There’s weather, there are puddles, distractions, and a direction to be traveling in. Fritz and Mona influence each other’s behavior, adding complexity. There are cars, people, and dogs barking from their yards. The mail carrier. The occasional squirrel. Dogs live in the moment, says Cesar, and to be good pack leaders, we have to get in the moment too. We will be better leaders if we can drop tension and negative energy, which tend to make the dogs unstable. Don’t people respond the same way? Picture the boss who walks through the plant, scowling and worried. (That would be me.) Then picture the leader who is calm and open, matching his or her energy to the people engaged in the work at hand. 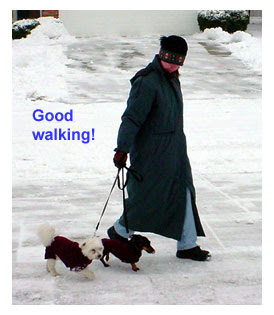 Fritz, Mona, and I have our safety practices that we need to follow consistently in our standard walking work. We stop before crossing the street. No one runs away. No one goes off on a tangent. We keep our noses pointed to our true north, even if it’s true west or true south. If Fritz starts heading off the path, I need to refocus him. Because he’s a dog, I give a slight tug on the leash to remind him to point his nose ahead. We have to balance flow. If Mona surges ahead and Fritz lags behind, we are out of balance. As the pack leader, I decide what the pace is, literally. Mona driving ahead is like the worker overproducing. Fritz tracking some smell and trying to stop to make his mark is like the worker who can’t or won’t keep up with the pace. If we keep in step, stop at the street crossings, and walk at a steady speed, we are in harmony and get where we’re going. After about half an hour, Fritz and Mona are usually walking calmly beside me, their leashes slack. As the leader, I need to remain calm when the unexpected interrupts operations. I need to be alert to hazards and problems. One day the sidewalks were icy. The leader wasn’t paying attention and hit some ice and fell. The line stopped. 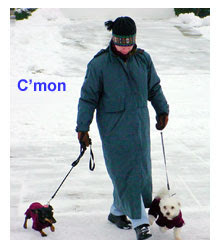 Fritz and Mona couldn’t keep walking as planned. On the way home, we encountered two abnormal conditions simultaneously. The mail carrier was walking toward us on the sidewalk. The Waste Management truck was driving up on our right to pick up the trash. We tried to pause on a driveway to let the mail carrier go by. Then before I knew it, Fritz, Mona and I were tangled up and one got underfoot and I was down on the ground again. No great damage except my jeans got a hole in the knee and one of my typing fingers got a scrape. I was embarrassed and blamed the dogs for tripping me. But as I walked on, I thought of what Cesar would say. If the dogs became unstable, what was my mistake as a leader? Maybe I could have chosen a street where the mail wasn’t being delivered and the trash wasn’t being picked up? Maybe I could have stopped on the driveway, but calmly, and we could have waited longer for our turn. With the confusion converging on us, I didn’t have to start ahead after just a quick pause. I could have listened to Fritz and Mona and sensed how much distraction they could take and stopped the line (without falling) until the confusion was resolved. 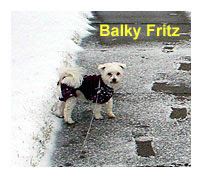 Fritz was giving me a problem for awhile, balking as we walked away from home and wanting to go back. He’d sit down on the snow and put the brakes on. Was the cold hurting his feet? Boots just made matters worse. Was he cold? His little fleece jacket didn’t help. Did he need firmness? Did he just need to be left behind? The most effective thing turned out to be walking him alone – doing some one-on-one time. He could practice our standard walking work without Mona’s energy distracting me. But the real cause came out sometime later. Consistency is critical processes, as you already know. Well, the “night operator” – Mike, who did the evening walk – used a different process. That was to let Fritz stop, smell things, leave a mark, take his time…or jauntily move ahead. Mona had to be held back, or she’d have to stop and wait. That was not flow. The answer was that we were not a three-dog pack. There were four of us. Fritz didn’t want to go on a walk without the whole pack being together. Leaving one member of the culture behind was holding back everyone. Actually, that didn’t result in a standard work of four of us progressing or even a consistent process with the night operator. But Fritz made the connection that there was one way to behave in one situation, and another way to act in the other. That extends to our “time off” daily trip through the park. Most of all, Cesar is teaching me that I have to pay attention to what dogs understand, to speak their language, to listen to what they are telling me by their behavior and body language. Just like the leader at the gemba calmly observing what is happening, whether people are happy or hostile, what they are struggling with, what’s the name of the person operating the bending machine, what’s written on the report-out boards. How’s the lighting? Are the workstations organized? Is the process moving in cadence? I had to ponder this comparison between leading a pair of dogs and leading people. They are not the same. Then it hit me – dogs are like the emotions we are trying to walk with every day. We have to deal with ours and those of the people around us. Different people have different emotional states – and different ways of managing them. Mona wanting to forge ahead or chase down a squirrel might be the sudden zeal that takes over after someone goes to a lean seminar, driving him or her to rush into changing things around, yelping at people. But if the pack isn’t moving forward, that emotional state isn’t making any difference. It’s just adding instability. Fritz holding back, or wanting to stop, might be the state of mind of the person unsure that lean is going to do any more good than the last thing. Maybe the emotion levels out as the person practices a defined process over and over again. Changing feelings by defining a consistent behavior through standard work. The night operator problem? That system worked in a much different way from mine. But the power in that system doesn’t agree with the premises of mine. There are some real disadvantages to trying to change that system. I don’t control it. We have to just adapt and deal with it. So there I am, with my little emotions running off in different directions with different intensities and I have to hope I can keep them leashed. I might lose control. Then what? Will you help me track down and recapture my runaway Mona? But we’re all just trying to keep our emotional pack moving forward without too much commotion. When the walk is done – the product finished – Fritz and Mona, or our conflicting emotions, settle down for quiet time and utterly calm naps. Working through the walk settled their energy and we’re all right where we need to be. One more note – Cesar Millan said in one of his books that he’s been called in to help certain high-powered executives to try to get their dogs under control. One of them sent a private jet to pick Cesar up. Cesar found that these people couldn’t be calm, assertive and consistent with their own pets. He was left wondering how well these people actually ran the organizations they were supposed to be leading. We can just about guess that their organizations didn’t have cultures of continuous improvement. What if top executives were hired based on how well they could walk a little pack of doggies? As lean progresses in your work or your life, I hope you will find more people who see themselves as the stream, not just bubbles. And for the lonely bubbles among you, keep hold of certitude. One of the things I like best about the lean community is that there is a sense of community. You can see it at conferences, on lean blogs and in virtual groups like NWLEAN. The development of the SME/AME/Shingo Prize Lean Certification was a community effort in the truest sense of the words. I think a kaikaku may be underway.